September 2, 1812 handwritten document where George C. Briggs is inquiring of Mr. Williams if there is anything due on the Sillas Tisdale Note and, if so, to have it - the payment or the information - sent to Briggs by way of Captain John Terry. The document may have involved the maritime shipping industry out of the Freetown, Massachusetts, area. Whether Sillas is Silas, or if it's Silas Tisdale or Silas & Tisdale or Silas at Tisdale or a vessel named Sillas out of Tisdale, I can't determine. The reverse, shown below, indicates that Capt. John Terry did indeed receive a payment, in the amount of $3 dollars and 34 cents. 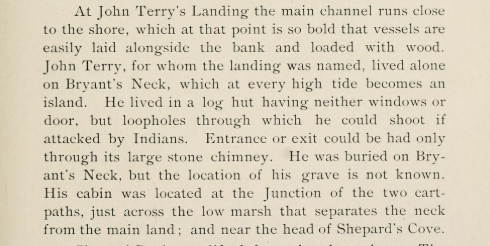 I found a George Chase Briggs (1784-1854) and a John Terry, both involved in the maritime shipping industry, mentioned multiple times in the 1902 publication: A History of the town of Freetown, Massachusetts: with an account of the Old Home Festival, July 30th, 1902. There's an especially interesting comment on a John Terry, shown below - presumably an ancestor of the sea captain John Terry. Perhaps Mr. Williams was Seth P. Williams, also a resident of Freehold, Massachusetts, or one of his relatives. There's a Find a Grave memorial for Abigail (Terry) Briggs, wife of George C. Briggs, and presumably George is buried there, too, but there's no memorial for him. If you can tie the clues in this document together in order to determine the locale and perhaps further identify the people mention, please leave a comment or contact me directly.